Warrenstreet Architects | Building on Hope Receives Gold Community Service Cornerstone Award! Building on Hope Receives Gold Community Service Cornerstone Award! Home>Uncategorized >Building on Hope Receives Gold Community Service Cornerstone Award! 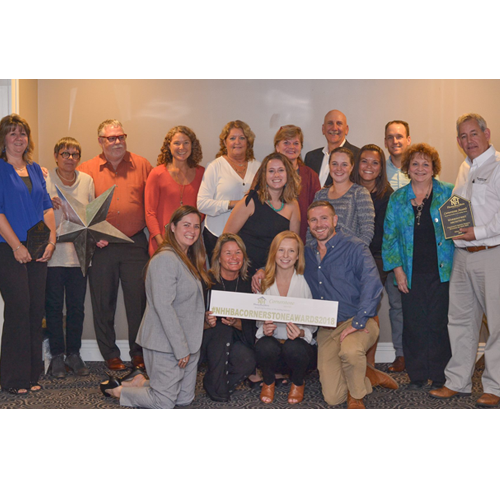 Bedford, NH – Warrenstreet Architects Inc., was honored to be recognized as part of the Building on Hope project team receiving a Gold Cornerstone Award for Community Service from the New Hampshire Home Builders Association (NHHBA). At a gala event held September 20th at the Manchester Country Club in Bedford, NH, Cornerstones are awarded in recognition of excellence in the building industry for members projects selected among a variety of residential and commercial categories. Building on Hope is an organization of New Hampshire volunteers including architects, builders, designers and other trade professionals that select a deserving local nonprofit to receive facility improvements and repairs with donated goods and labor every two years. With the motto of “many hands make light work,” the $500,000 volunteer led renovation of the Crisis Center of Central New Hampshire (CCCNH) of Concord was Building on Hope’s fifth project completed to date. CCCNH provides services to victims and survivors of domestic violence, sexual assault, elder abuse, stalking and child abuse. With a mission to empower individuals to make positive changes in their lives and become independent members of their community, their 120-year-facility underwent a near total gut renovation, almost doubling their occupational capacity furthering their ability to serve those in need. More than 400 volunteers and 280 businesses contributed to the overall effort that became a catalyst for CCCNH’s purchase of an additional facility to become the future “Center for Survivor Support”. Following a year of planning, one-week demolition and one week build effort, the final project reveal and ribbon cutting was held on May 20th, 2018. As a Co-Founding Member and Co-Chair of Building on Hope, Warrenstreet Architects, Inc. is proud to serve as an integral member and lead designer of this ongoing community partnership series centered which to-date has completed in excess of $4.1M in renovations. Principal Architect Jonathan Halle and Architectural Designer Kelly Leitner of Warrenstreet serve as project Steering Committee Members and were among those accepting the award on Building on Hope’s behalf.